Finally I get around to showing you what I did with this Silhouette file! You can go that post to download the free Silhouette file. I decided to put it on a floating glass frame - one that could be left blank, or used with paper, a photo, or artwork underneath. Lining up vinyl on glass can be difficult. 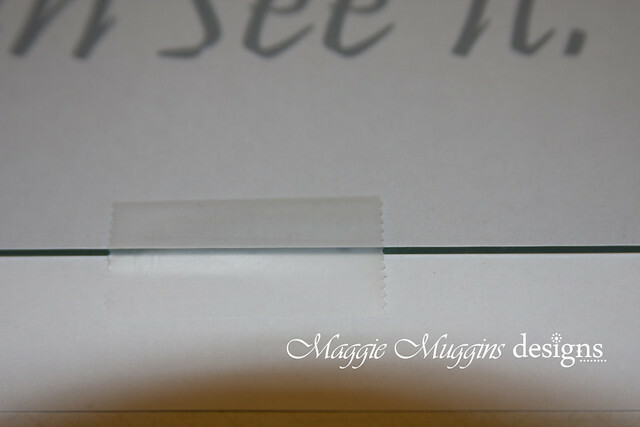 This time, instead of measuring, drawing lines on the glass and paper, I centered the image and aligned them in Silhouette Studio, then centered them inside an 8x10" rectangle (which I made a light grey) and printed it out. I centered the glass over the paper then taped it to keep it from shifting. It's hard to see here, but that's on the paper (no vinyl on the glass yet). Now with clear transfer paper it was a cinch to get in the right spot! Of course, I messed up on the last few letters because I cut them separately and just stuck them on later. Frosted Vinyl is probably the hardest to fix after the fact. It sticks well. So simple. I love visual representations of quotes, and I think this one is perfect! 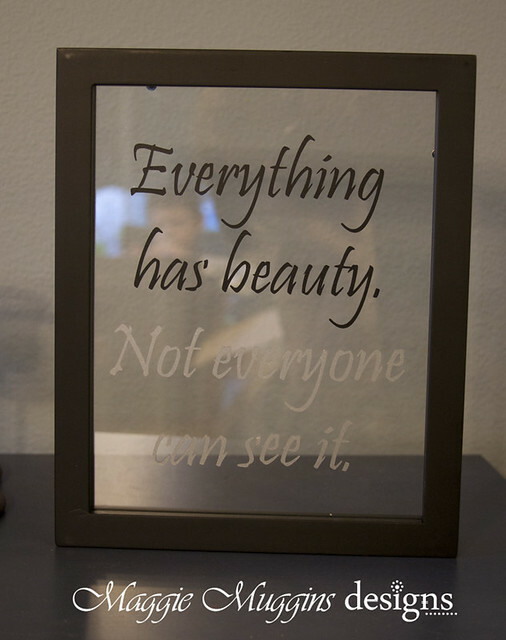 *This project uses Black Vinyl and Frosted Glass Vinyl and was cut on my Silhouette Cameo. Two weeks ago I promised to show you what I did with this Silhouette file I shared with you all. Then life happened and I didn't get around to it. Woops! First we had snow that just had to be played in. 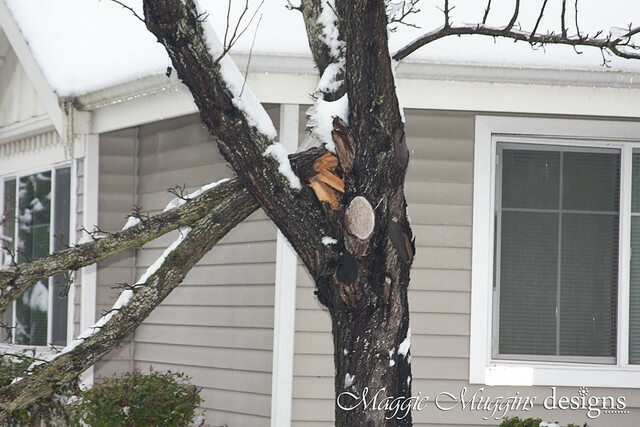 Then more snow came... enough to weigh down the trees. 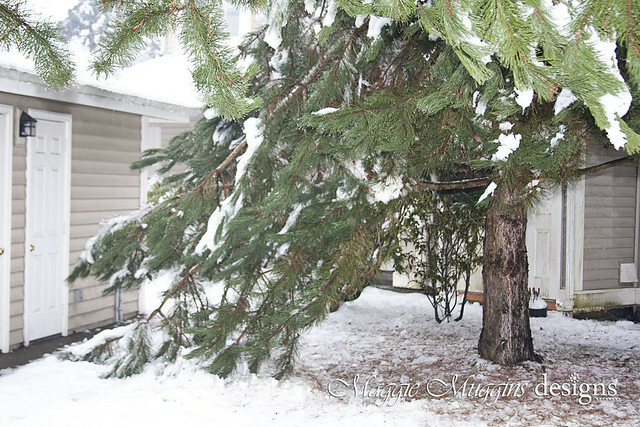 Those branches are normally above the doors you see in the photo! 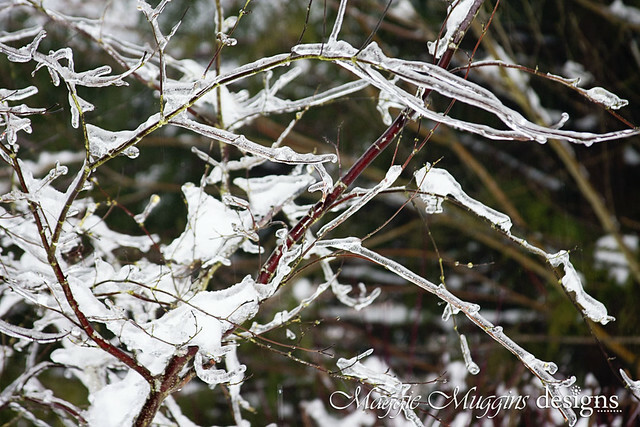 Then it melted and got icy and trees everywhere started falling. And the fallen trees made a mess - everywhere. While we were lucky to never lose power, we did not have cable, phone or internet for nearly three days. Wow - I never realized how much I rely on technology! I enjoyed hiding out in the house with my family. It felt like Christmas all over again. Except this time there was snow too! It was so nice to have my husband home and get many things done! 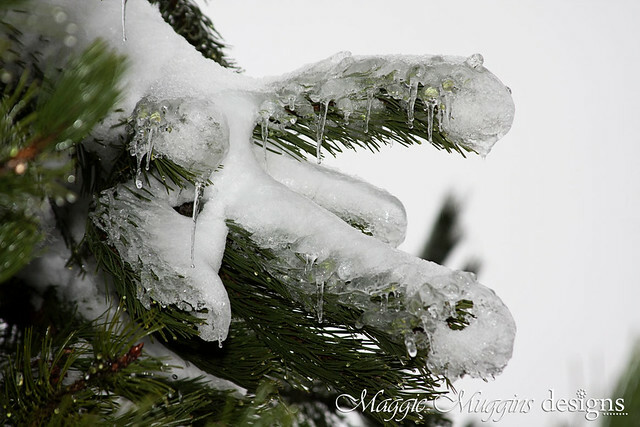 I have lots of projects to show you - but for now - enjoy the winter beauty! I have only recently decided to sort my files in Silhouette Studio. There were 2 reasons. 1. I have a lot more files now than I used to and looking through them all can be a little overwhelming! 2. I couldn't remember what file was the free file the second week of January and was kind of freaking out because I wanted to remind you all about them for the Silhouette Free Shape Link Party. 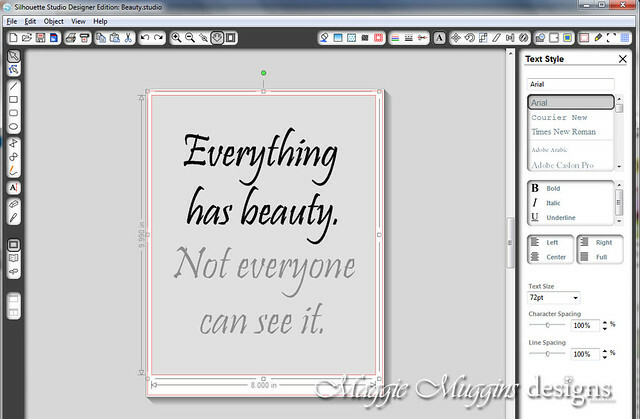 Thankfully Silhouette Studio made it really easy for me. I went in to my downloads folder and right clicked beside the images then chose "Sort By" and "Date Downloaded"! The last images downloaded showed up at the very bottom. Of course, I don't buy too many shapes, and I was able to figure out quickly which ones are from this month. You can see how I've sorted my images into different folders on the left. Of course, at the top there's a "Show All Designs" link so I can still see everything at once - sorting is really helpful for organizing. It's easy to create a new folder. Just right click on "My Library" or the other "My" folders, and choose "New Folder" - a new folder will show below and you can type in the name for it. The images below are the free files we're going to use for next week. Tuesday the 31st there will be one more shape to download. That one will be in this link party as well. Don't forget to download this week's free valentine shape! Have you used any of the free shapes yet? I've got a few ideas already, and I can't wait to share them next week. My husband and I have discussed fashion trends lately. I see how caught up in fashion some women become and it surprises me. I'm not talking about being aware of the trends, looking good, and wearing up-to-date fashions. I'm talking obsessed, can not wear something if it's not the newest trend. I'm referring to those who can't wear flats because apparently heels are in, who are the first to wear new trends, regardless of how incredibly weird they might be or how bad they look on them. I understand it a lot more among teenagers who are still discovering who they are, and who live in a world where fashion and acceptance are deeply intertwined. I used to be one of them. I remember it well. Recently on a shopping trip however, as I admired the latest trends I noticed something deeply different about me. I loved some outfits, I appreciated the quality of the clothing and yet I also rejected some things I saw in the windows. It didn't matter to me if that was the hottest new trend or not. I knew I would never wear it. I used to have to do my hair and makeup every day. I used to never leave the house without mascara, I even had to swim with water-proof mascara, and I gawked at the girls who had the audacity to wear work-out clothes in public. How could they? How dare they? Deep down I honestly was envious of them. Deep down, I didn't feel pretty enough to not dress up. It wasn't that I didn't think I was pretty. Just not pretty enough. I had to look good all of the time. I think the change in how I saw myself began as a missionary for The Church of Jesus Christ of Latter-day Saints. I didn't have the time every morning to get my hair just so. I didn't have the time to fix my hair or make up and I definitely didn't have time to shop for the latest fashion, the cutest dress, or the most adorable shoes. I looked in the mirror so much less, but I felt so much better about myself. More years of experience, marriage and motherhood have made me even wiser. I am pretty enough to not dress up all of the time. I am pretty enough to not to have perfect hair every day. I don't really look THAT bad, and on top of it it doesn't matter AS much anymore. I am beautiful, but I don't feel the need to prove it by looking like a super model. Don't misunderstand me. I still like to get dressed up, do my hair and make-up and look beautiful. But I don't NEED to do it in order to make myself feel beautiful. 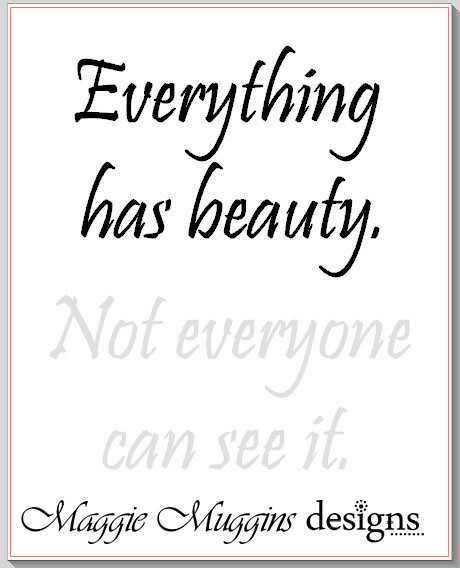 You can download the quote "Everything has Beauty. 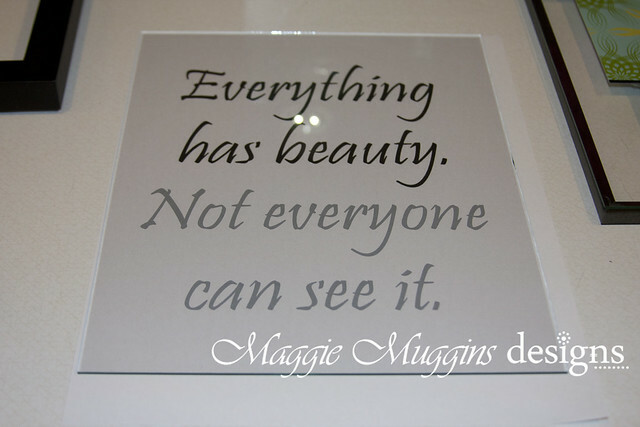 Not everyone can see it." as a Silhouette cut file (for PERSONAL USE ONLY) HERE. I will show you how I'm using this file later on this week! A few months ago I tried out embroidery on my machine. 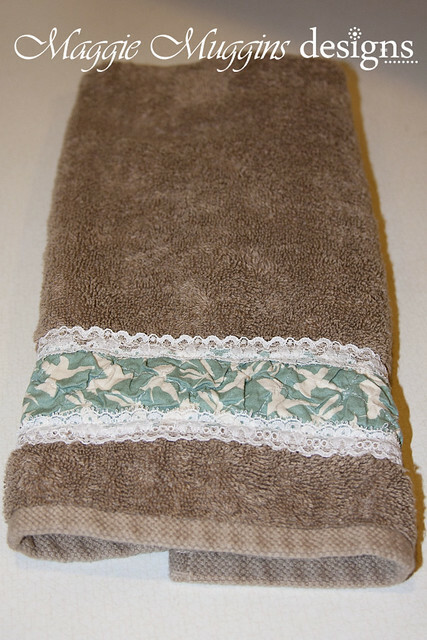 I showed you the cute CTR Towels I made - but I did not show you the hand towel I tested on. I used a light pink thread, font that was too small, and got it in the wrong spot on the towel! Way to go. Seeing as you can barely see it on the back (because light pink was not a good color choice) and to save myself time unpicking the mess - I decided to give the towel a makeover. I pulled out a scrap piece of bubbled fabric from this project. You can head to that link to learn more about TEXTURE MAGIC and how to use it to make your own texturized fabric . Superior Threads makes this awesome product! This was the biggest piece of the fabric I have so instead of folding it under I covered the raw edges with lace. I have to confess, I have a stash of beautiful Belgian lace that my brother brought home from Belgium for me over 10 years ago! I use it sparingly, but this project called for me to use it. It completely covered my embroidery mistake on the band and was so easy. Seriously folks 6 straight seams! 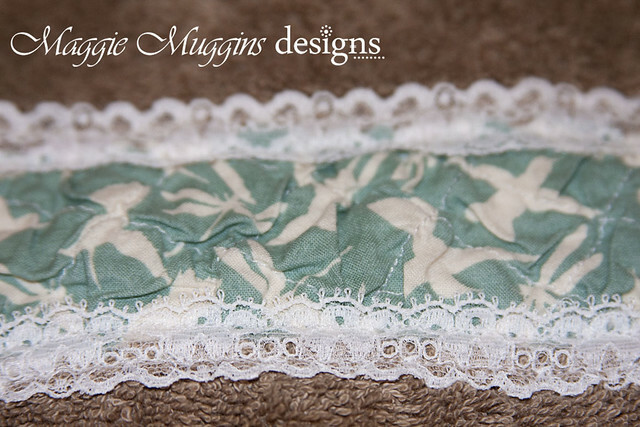 First I sewed on both edges or the textured fabric lace on each side. I sewed along both edges of the lace so that it wouldn't pull up from the towel at all and it also completely covered the raw edge of the fabric for me! I've been using the towel in my kitchen for some time now and it's been washed many times - the fabric is holding up really well and it still looks really good. This is the first time I have used this kind of towel in the kitchen. I love having it there. It's so much better than a dish towel! 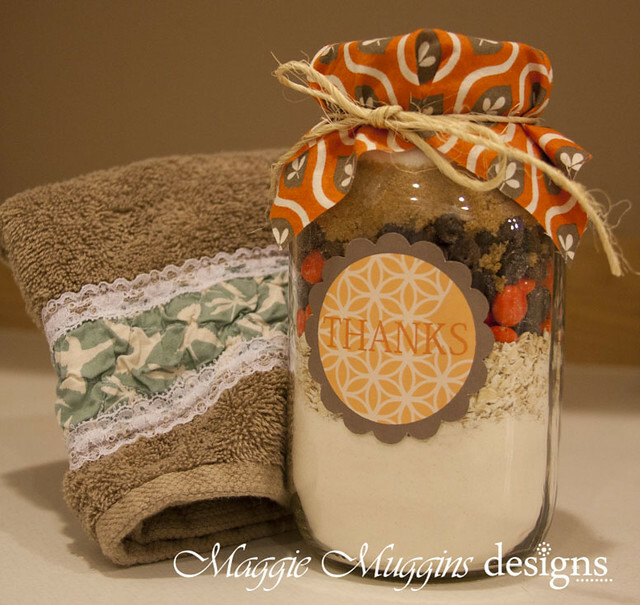 Have any of you used a bath towel in your kitchen before? 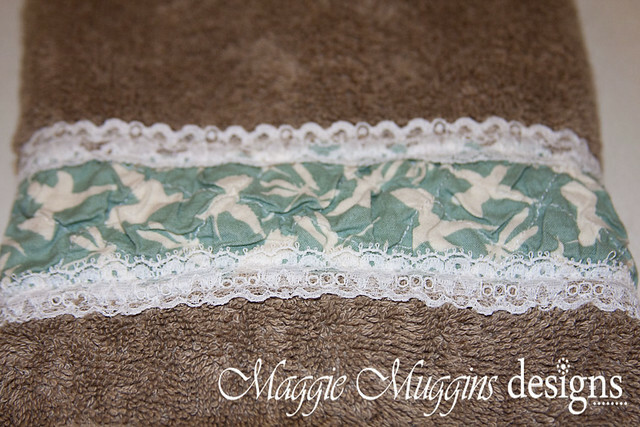 *This fabric is Flock in Ocean from the Arcadia collection by Sanae for Moda. 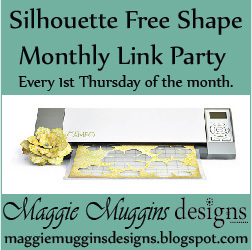 Silhouette Free Shape of the Week Linky Party Announcement! Silhouette Free Shape LINK PARTY Begins February 2nd! Motivate all of us to use shapes we can get for FREE! 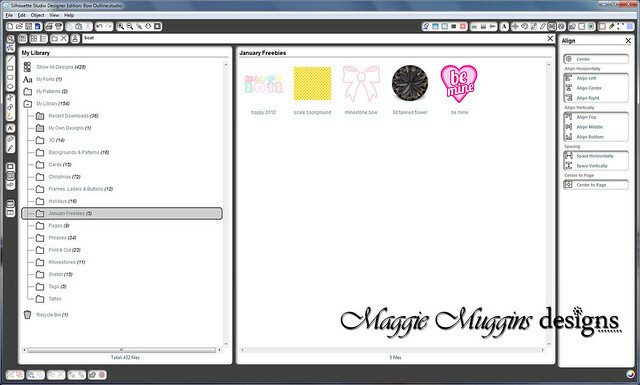 Inspire those who participate and those who just come to check out the projects with lots of new Silhouette Ideas. Silhouette gives away a shape every Tuesday on their site. Every month you can get 4-5 free shapes that way! I download them every week, but a lot of them sit there, completely unused. In fact, a lot of my shapes have never been used! Do you have the same problem? So, to challenge all Silhouette owners out there to get creative and use their free shapes, this party is specifically for the free shapes. On the first Thursday of every month I will put up a link party for projects made from the shapes of the previous month. That means you have a whole month to come up with an idea based on one of the shapes. You can do whatever you want with the shape. 1. You may link up ONLY one item per free shape from the previous month. (Meaning 4-5 different projects may be linked depending on the month). 2. The free shape must be incorporated in the project but does not have to be the main shape, or only shape in the project. 3. 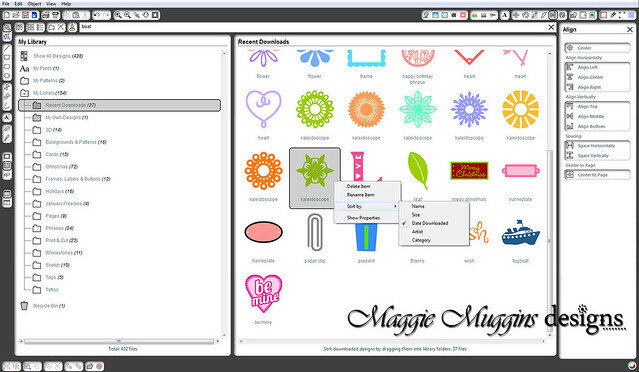 All Silhouette shapes used must be listed within your post or on the SAME page as the photo linked. 3. The party will be open for three days to link up. It will close the Saturday after it opens. 4. You must link back to my site within your blog post or on the SAME page as the photo you link up. I will provide two button sizes and a banner with their links for you to choose from. 5. I will reserve the right to remove any links (be it inappropriate, marketing, or otherwise). 6. If you link up please check out the other projects linked up and comment on them. When possible (remember, I am a MOM first and foremost) I will do reviews on my favorite projects. If you are interested in promoting your business (Silhouette related) by sponsoring rewards for the SFS Link Party or by having your business highlighted in the link party post, please feel free to contact me. I will have more information up about this in the days to come. IF by any chance you have ideas or suggestions please let me know. I'm open for any and all suggestions. The SFS Link Party Begins on February 2, 2012 so start downloading and using those free shapes! I look forward to seeing everyone's projects and being inspired to create in new ways. 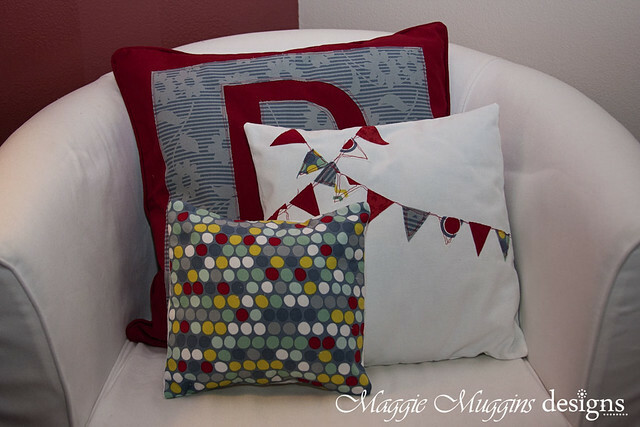 I have been wanting to make decorative pillows for a while now, but have been busy with other projects. I decided I wanted to make some after discovering cheap pillow forms at IKEA. I explained that in my previous post, this one is to show you the details of the pillows. Heavy white cotton canvas for smaller cases I had already (I used a curtain panel and cut the back on the hem so I had way less sewing to do). For the applique's I used Pellon's 805 Wonder-Under. I usually buy it a few yards at a time when it's on sale, then I always have it on hand. I ironed on the Wonder-Under to a 4x6" piece of fabric. Then I cut one octagon from each fabric about 2.5 inches in size. I laid them all out on the pillow front and decided the best layout before removing the backing and ironing them in place. After I had them ironed in place, I stitched all the way around each hexagon twice. 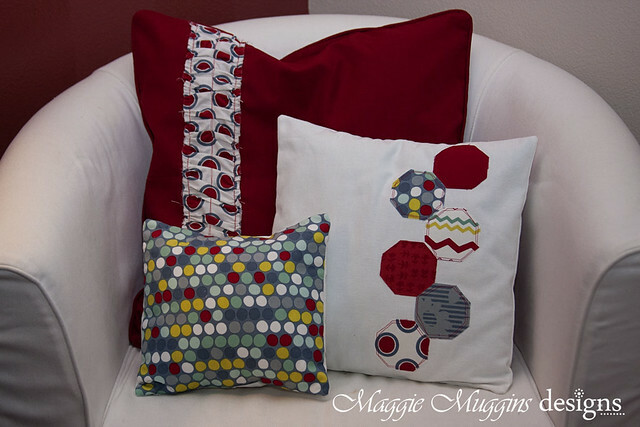 I wanted this to have a casual feel, so I was not careful with my stitching on any of the pillows. After the applique was finished I sewed the back onto the cover. 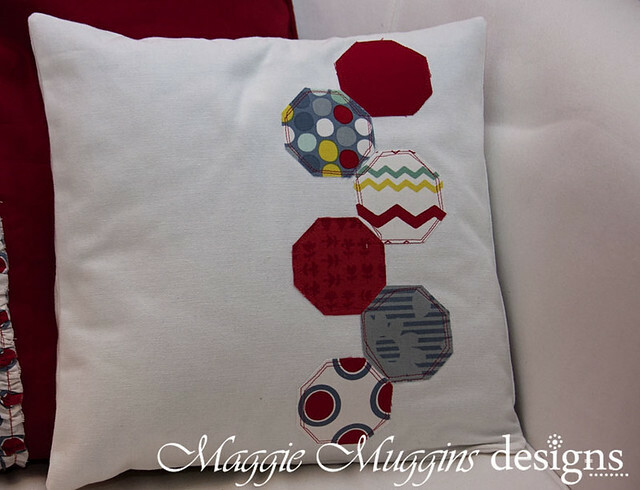 Using the pieces left over from the Octagon pillow, I cut out 2-3 triangles from each fabric. The triangles were about 1.5 inches in size. This pillow was inspired by a Cosmetic Bag I saw on Just Another Hangup. ( I love her sewing projects!) I ironed the left side in place and stitched, then the right side. To speed things up I used my free motion quilting foot and dropped the feed dogs. It meant I didn't have to keep turning the fabric, but sadly, I am very inexperienced in this area, so it's REALLY sloppy. Oh well, kind of what I wanted anyways. Again, I stitched every line twice or more to give it a more playful look. 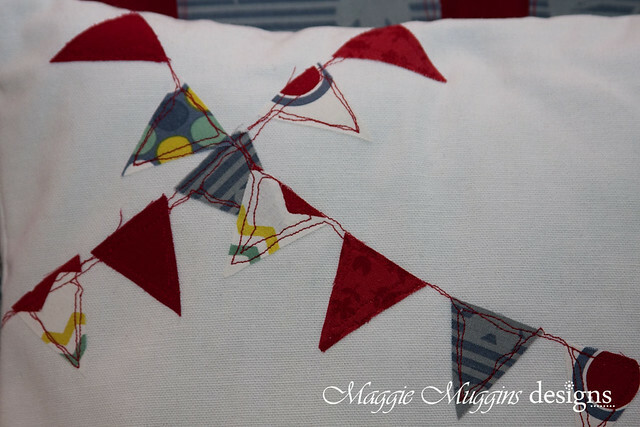 After I had the bunting sewn, I finished the pillow cover by sewing on the back. 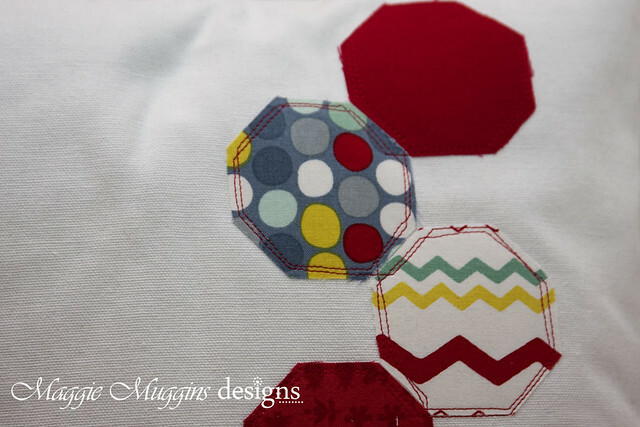 Want to try the Octagon or Bunting pillows out or make a paper version this? You can download the 12x12" Silhouette Cut file HERE and speed things up. (It's easy to re-size to 8.5x11. Then just use 4x5" scraps of fabric with Silhouette Sewable Interfacing and you can cut several pieces at one time! This pillow is 10x10" in size. I wanted the same quality of the other cases that I made, but I did want to use a solid piece of one of the fabrics. 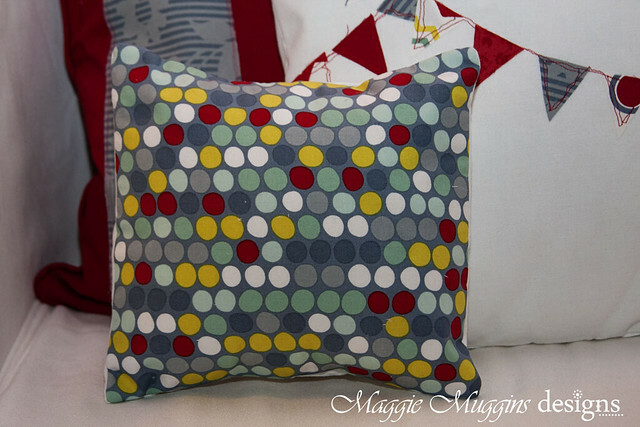 I chose the polka-dot, but basted it to the canvas fabric to have a stronger front to the pillow. Then I sewed on the back of the pillow cover. This one was super easy!!! To save money on the insert I used a 14x14" insert from IKEA, cut it down to 10x10" and sewed it back closed. 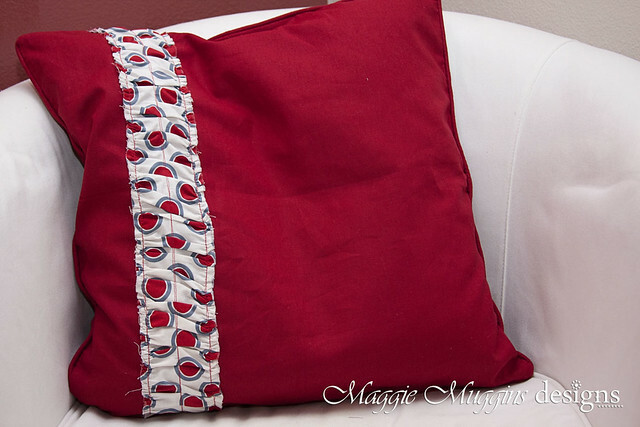 These last two pillows I used IKEA's AINA Cushion Covers (Red 20x20" Cotton-Linen) They were $6.00 each, have nice piping around the edge, and zippers along the bottom. That and they matched my fabric pieces. I knew that because of their size it would be pretty easy to sew something onto the front. Using what I had on hand, I took a 3x34" strip of fabric and gathered both sides. I lined it up a few inches from the edge of the fabric using my cutting ruler and pinned it in place on both sides. I tried to keep the gathers lined up on either side and pinned the other side. Then I sewed the edges and the middle. 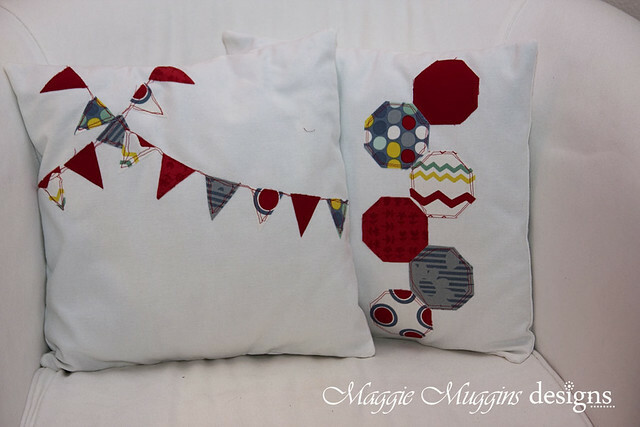 To match with the other pillows, I sewed all lines twice. 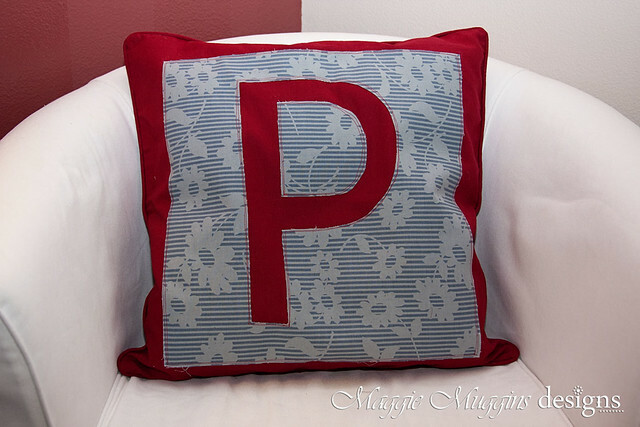 For the letter on this pillow I used this KaiTi font. In Silhouette I sized it, then printed out the template (it cropped about an inch from the bottom when printed, but I just measured it out. I traced the letter onto the back of the Wonder-Under (in reverse) and ironed it onto the back of the 15x15.5" piece of fabric. 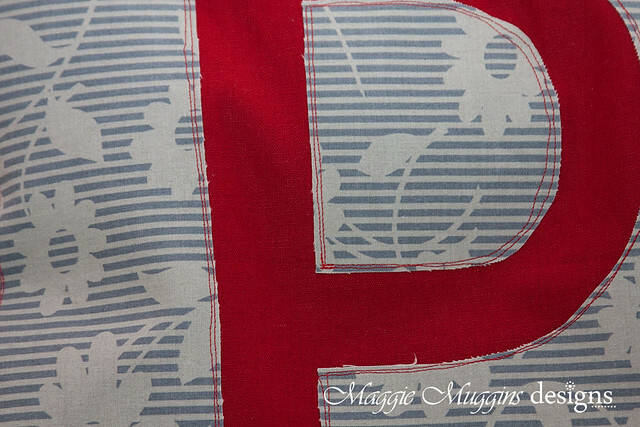 Then I cut out the letter, and ironed the outer square on, as well as the inner cut-out from the "P". Then, as with all the other pillows, I stitched the edge of everything twice. It was sloppy stitching too, but meant to be. 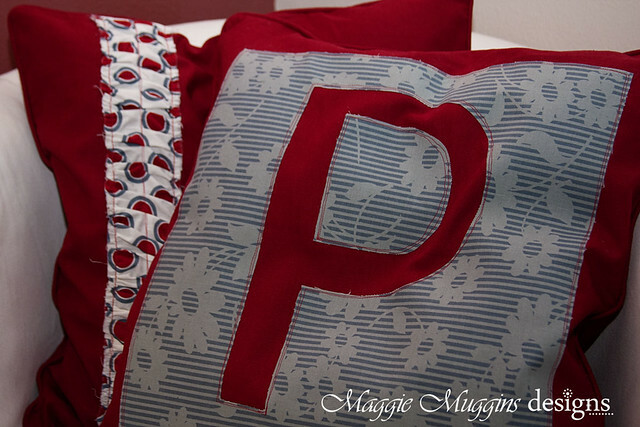 I like how this takes the classic monogram and makes it more playful to match the rest of the pillows. That's all! After stuffing in the pillow forms I bundled these up with a large ribbon and delivered them to their new home! How many times have you looked at a decorative pillow in a store and thought you can make it for cheaper? Have you priced it out though? Pillow forms at Joann's are not cheap. 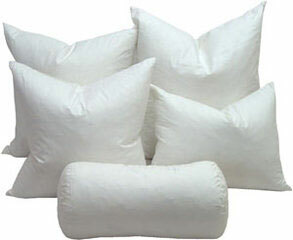 In fact, after making my own pillows once, I never intended to do it again. It just wasn't worth it. Even if you got them all on sale it is still expensive! Might as well just buy pillows at Target OR Amazon and save myself the work and possibly even some money! *Note - I realize that you can just buy the poly-fill and stuff the pillows, but I covers that can be taken off and washed. I have little boys, remember? A while ago I discovered pillow forms at IKEA and realized that I could save a lot of money if I used them. 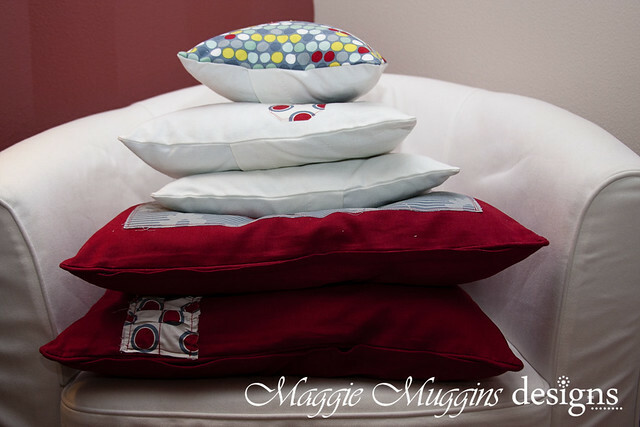 They only have specific sizes, but considering the savings, I was more than willing to sew pillows again. $33.33 but at IKEA for the same amount of pillows you will spend $10.85 (I'm calculating in WA state taxes). Just about 1/3rd of the price! Of course, let's face it - when you take coupons to Joann's either what you want is already on sale and not as low as 40% off so you can't use any coupons, OR it's not on sale and you only have 1-2 coupons so you pay full price for the rest. Am I right? !